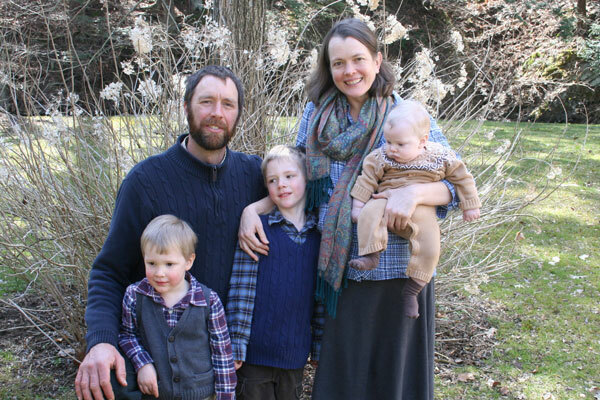 Plowshare Produce is a small, organic vegetable farm, a farming family, and a community of supporting members who share in the farm’s abundance. 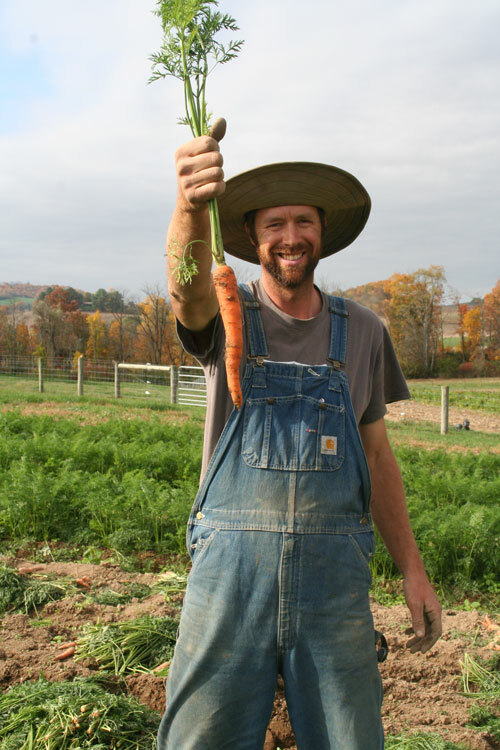 You’re always welcome to visit the farm to see your food from seed to harvest! Your weekly bag of produce – with over 40 kinds of vegetables throughout the season – encourages healthy cooking and eating. 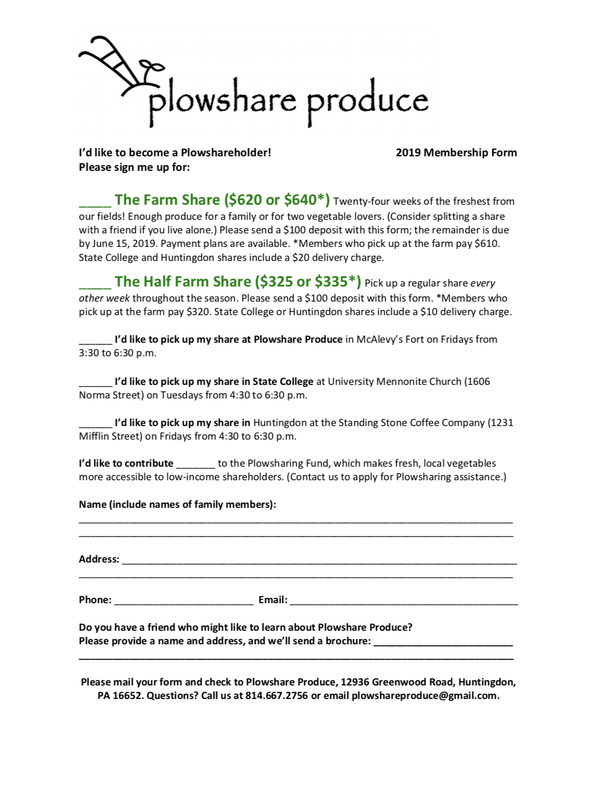 Picking up your share or coming to a Plowshare potluck are great opportunities to meet your neighbors. Your money stays in the local economy and benefits your community by sustaining a small, diversified family farm. Come to the farm once a week – or to a central location in State College or Huntingdon – to fill your bag with the best of the day’s harvest. Half shares offer the opportunity to pick up a share every other week. Sign up to receive our weekly newsletter, check out the week’s vegetable selections, and then contact us only when you’d like to receive a share – any week of the season. This pay-as-you-go option is available only for Friday pickup at the farm or in Huntingdon. Trade your labor for vegetables! 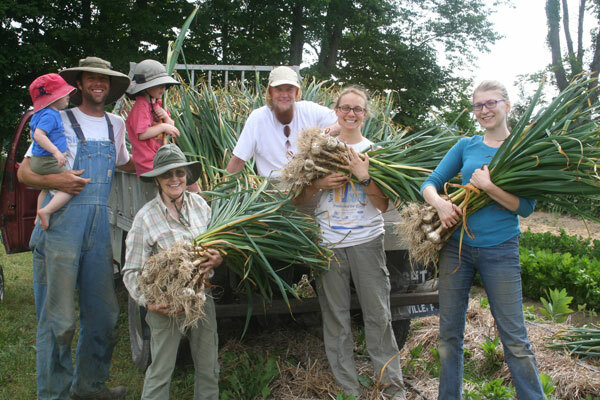 Join our harvest and weeding crew on Tuesday or Friday mornings and receive a full or half farm share in exchange. Read our work share guidelines. We partner with other small farms and businesses to offer shares of local eggs, flower bouquets and fair-trade coffee. Members can also order local meat and fruit in season. We are committed to making our vegetables available to all, regardless of income. Contact us to apply for share assistance or, if you are able to give, we welcome your contributions to the Plowsharing Fund. Sign up for the 2019 season! Fill out the form on this site, or download the form below! 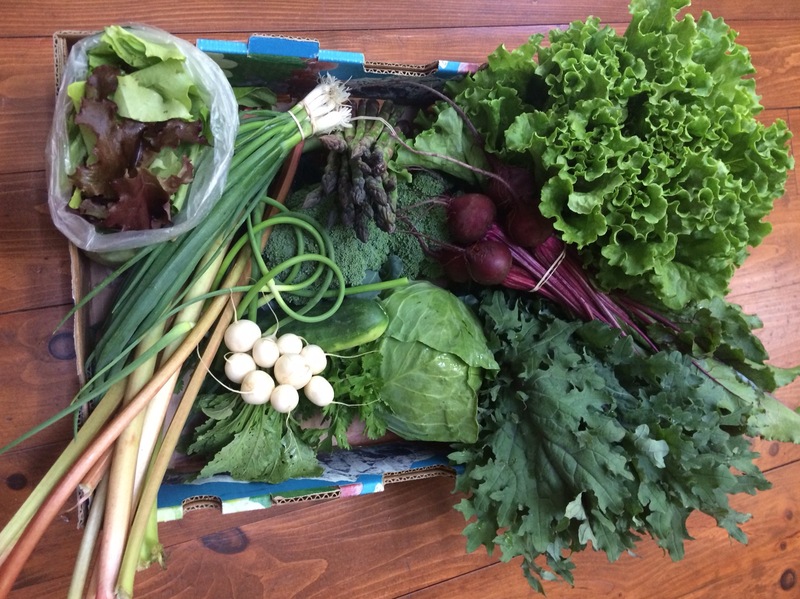 We send a weekly e-mail with news from the farm, a list of the week’s vegetables and recipes and tips for using your produce. Sign up here! Micah Spicher Schonberg grows the vegetables at Plowshare Produce. Bethany Spicher Schonberg handles logistics and feeds everyone. Three little farm hands eat their vegetables straight out of the gardens and keep things lively. Next door, Grandpa and Grandma – Tom and Sharon Spicher – bless the whole operation with helping hands, homemade cookies, wisdom and fun. They also host Plowshare’s gardens on their land, where Sharon’s grandfather farmed with horses in the 1940’s. We hire full- and part-time help during the growing season, from April through October. Read our employee guidelines. We welcome volunteers to the farm! Please contact us a week ahead of time to schedule. Take Route 26 S about 15 miles south of State College to McAlevy's Fort. The road curves right into town. Pass the Stone Valley Community Charter School on the left and look for the second place on the left after that. Pull into the parking lot of the brown house with a wagon wheel porch and red roof – just after the Plowshare Produce sign. Take Route 26 N about 15 miles north of Huntingdon to the stop sign at Ennisville and turn right. Cross a small bridge and pass a farm with a white barn, gray house and a black board fence. Turn right into the parking lot of the brown house with a wagon wheel porch and red roof – you’ll see the Plowshare Produce sign just ahead. Take Route 305 W across the mountain and past Greenwood Furnace State Park. At the stop sign in McAlevy's Fort, turn left on Route 26 S/305 W. Pass the Stone Valley Community Charter School on the left and look for the second place on the left after that. Pull into the parking lot of the brown house with a wagon wheel porch and red roof – just after the Plowshare Produce sign. All content © 2018 Plowshare Produce. All rights reserved.